David Gill over at looting matters has had some interesting things to say about due diligence in recent days. I agree with him on a number of points, including the problems caused by the destruction of archaeological sites, some of the silly rhetoric the numismatist-lobby has used on the internet and the scope of the antiquities problem generally. He has also contributed some excellent scholarly work by moving beyond mere anecdotal evidence towards concrete data. I disagree with him strongly on the ability of a licit antiquities market to remedy some of these problems however. I think he misses the point on due diligence procedures in acquiring antiquities. You can argue they are voluntary, are not followed, or are too weak. But rigorous due diligence procedures are absolutely essential to a better state of affairs and can have a quick and quantifiable impact on the black market. On Friday, he rightfully took John Merryman to task for using the acquisition of antiquities by Marion True for the Getty as an example of due diligence procedures which were unfairly criticized by archaeologists in 1989. Gill points out that the archaeologist's criticisms of the policy were vindicated with the decision by the Getty to return 40 objects. I think Merryman should admit he was wrong on that point. However, Merryman's more important point, and the one Gill fails to account for is that there needs to be a licit trade in antiquities with clean provenance, and the current state of regulation in source nations makes that impossible. We should also keep in mind that the new acquisition procedures of the Getty museum are now quite rigorous, and the Getty should be recognized for righting its ship. The Indianapolis museum of Art has also adopted some very strict procedures. I do not think anyone would argue that the present legal framework of regulating antiquities works. Sites are looted, and the black market continues to thrive. The important question becomes how can we prevent that? Establishing provenance is a difficult thing to do, especially when they are often fabricated. Auction catalogs say "from a Swiss collection". Such information is not enough to create a clean chain of title. Relying on such information is not enough to satisfy a proper due diligence inquiry either. In determining whether the possessor exercised due diligence, regard shall be had to all the circumstances of the acquisition, including the character of the parties, the price paid, whether the possessor consulted any reasonably accessible register of stolen cultural objects, and any other relevant information and documentation which it could reasonably have obtained, and whether the possessor consulted accessible agencies or took any step that a reasonable person would have taken in the circumstances. The next day Gill turns his attention to the Ka-Nefer-Nefer mask, pictured above. It was purchased by the St. Louis Museum of Art in 1998 from the Phoenix Gallery, run by the Aboutaam brothers who have had legal issues in both the United States and Egypt regarding antiquities transactions. An outstanding article by Malcolm Gay for the River Front Times revealed that the sculpture may have been stolen some time between its excavation in 1952 and its acquisition by the St. Louis Art Museum in 1998. "I think for 1998, the year that this mask was acquired, the level of diligence that was done here is exemplary," says Brent Benjamin. "We had an inquiry hand-delivered to the Cairo Museum's director, Mohammed Saleh, saying that this was an object that had been offered to the museum for acquisition, and did he know any reason why the museum should not do that. We got a written response from Dr. Saleh that raised no concerns about the acquisition." The letter the museum sent Saleh contains sparse details. The letter, penned by Sidney Goldstein, the museum's antiquities curator who initiated and oversaw the mask's purchase, says the museum has "been offered a mummy mask of the 19th dynasty and I was wondering if you know of any parallels to this object. I have never seen anything quite like it with a reddish copper-like face probably owing to the oxidation of the gold surface. It is currently on exhibition in the Egyptian exhibition at the Museum of Art and History in Geneva. I would greatly appreciate your thoughts on any parallels you might know of this piece and hope that I might have the opportunity to speak with you in several weeks by telephone about this opportunity." Goldstein sent a photograph and physical description of the mask along with his letter to Saleh, but he did not mention Goneim by name, nor did he refer to the Saqqara excavations. "The excavation information was not on the description of the mask because the letters [to Saleh] were sent out before the entire provenance was even discussed," says Jennifer Stoffel, director of marketing for the Saint Louis Art Museum. "This was early on, when we were only considering the object." That is a very important fact Gill misses. To be sure, the acquisition should have raised a number of red flags; and I think the Egyptians probably have an excellent ethical claim for repatriation. But there will not be a tenable legal claim under US law. It does not appear Egypt had adequately documented their collection. If they had, and the collection was stolen from a storeroom as the article indicates, Egypt would have had an absolute legal right to the object because it was stolen, and the museum would have had a claim for the purchase price against the Phoenix gallery. This would have rewarded a diligent purchaser, punished the Phoenix gallery for selling a dubious work, and the object would have returned to Egypt. A very important and inexpensive step which source nations absolutely must do is to document their collections. Granted, such a step may have been more difficult 10 or 20 years ago, and the letter could have provided more details to Saleh, but Egypt needs to make it easier to check provenance, not harder. The museum made a questionable acquisition to be sure, but Egypt dropped the ball as well. This reinforces Merryman's persuasive argument that source nations should consider excess cultural objects which are merely gathering dust in a storeroom. At the very least I think antiquities leasing or long-terms loans should be used. It adds to the cultural exchange, and most importantly creates revenue which can be used to protect sites and excavate them before looting takes place. Thank you for this repsonse. I am not sure I agree with everything you write. But I wonder if I can pick up on two points. The mummy mask was documented in the Saqqara store. So your quibble must be over checking against inventories. 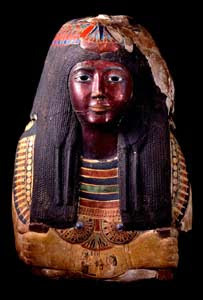 So the St Louis Museum wrote and asked the Cairo Museum - but why did they not write again when they were supplied (by the dealer) with information that suggested that the mask had been "given" to the excavator? Due diligence means checking the other side of the story. But would it have led to an uncomfortable truth? I was an intern at the Supreme Council of Antiquities, Egypt this summer and worked on the case of the Mask of Ka-nefer-nefer extensively. First of all, the director of the SLAM did NOT contact the Cairo Museum, as you say. He merely contacted Dr. Saleh who was, at the time of the inquiry, retired from duty as Museum director. That withstanding, Dr. Saleh would not have been the correct person to contact anyway. The SLAM should have contacted the SCA or the Minstry of Culture directly. Second of all, Dr. Saleh's response letter - made public by the SCA and provided to the SLAM on numerous occassions - does NOT state that he approved of the SLAM's acquisition. The SLAM asked Dr. Saleh if he knew of any comparanda with which to acquire a better provenance for the Mask. Dr. Saleh replied that he did not and suggested contacting other museums with similarly extensive Egyptian collections as the Cairo Museum. The SLAM's correspondence with Dr. Saleh "of the Cairo Museum" in no way constitutes 'due diligence'.